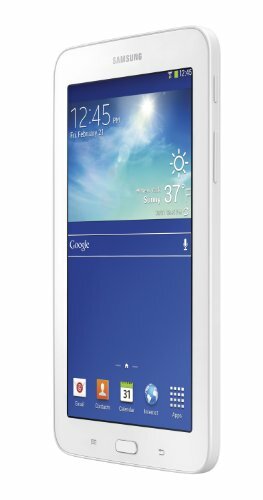 At a Glance: Slim, lightweight tablet with 7-inch displayWatch movies, play games, read, browse the web, and moreDownload apps from Google Play StoreAndroid 4.2, Jelly Bean OSProvides up to nine hours of battery life per charge8 GB on-board memory; add up to 32 GB memory with microSD slotIncludes 2-megapixel rear camera A Lightweight, Portable CompanionSlim, Compact Design with Long Battery LifeWith its slim, lightweight design, the Galaxy Tab 3 Lite is easy to take with you wherever you go. It offers up to nine hours of battery life per charge, so you can browse the web, play games, check email, and enjoy social networking for longer without recharging. Access More Than One Million Apps at Google Play StoreThe Google Play Store gives you instant access to more than one million apps and games. Download your favorites like Skype, Pinterest, Facebook, and Candy Crush Saga or discover new movies, TV shows, music, books, and games. 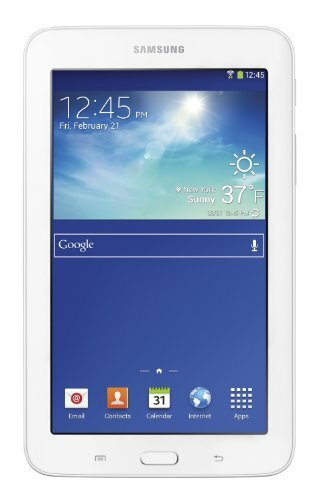 The Galaxy Tab 3 Lite also comes preloaded with popular apps, including Gmail and YouTube. Endless Entertainment OptionsWatch a movie, go shopping, play games, listen to music, read the latest bestseller, and check in on Facebook or your Pinterest boards. The Galaxy Tab 3 Lite gives you plenty of ways to relax, be entertained, and stay informed. Vivid Display for Movies, Games, and ReadingThe Galaxy Tab 3 Lite features a 7-inch display with 1024x600 resolution, making it well suited for watching the latest movies and TV shows, reading e-books, playing games, and more. It's powered by a 1.2 GHz dual-core processor for fast, reliable performance. Rear Camera for PhotosA 2-megapixel rear-facing camera allows you to take photos and upload them instantly to your favorite social network. Enjoy instant access to more than one million apps and games. View Larger. 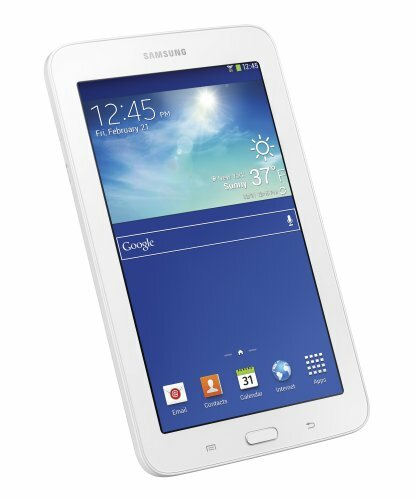 Galaxy Tab 3 Lite offers endless ways to relax,be entertained, and stay informed. View Larger. Free Content with Galaxy PerksComes With Hulu Plus, Google Play Credit, and Dropbox SpaceWith Galaxy Perks, you'll also receive free content and services, three months of Hulu Plus*, 50GB of Dropbox space, and more. *Available to new Hulu Plus customers only.Check out www.samsung.com/us/galaxyperks to learn more. Expandable Memory to Store Photos, Music, and VideosThe tablet offers 8 GB of onboard memory and includes a microSD card slot that allows you to add up to 32 GB of additional memory (microSD card sold separately), making it easy to store songs, videos, photos, and other files. What's in the BoxSamsung Galaxy Tab 3 Lite, USB charging cable, wall adapter, and quick start guide.